I've spent a chunk of time this morning reading what's out there in social media regarding trading, trading psychology, and trading methods. A lot of sites, a lot of tweets. A lot of what I read boils down to, "Once you've found your edge, stay consistent in your mental/emotional state and in your trading practices." Why is it that so many professional money managers (not to mention individual traders) fail to meet performance expectations? I would argue that the reason is that they have followed their own advice. They found their edge, they stayed consistent with it, and they have been left behind as markets have changed. In other words, traders have failed because there is much, much more to trading psychology than maintaining emotional control and following routines. Successful traders and trading firms create and innovate--just like any successful business. They operate in a dynamic environment and they find ways to adapt and exploit *new* sources of edge as the marketplace evolves. The Achilles heel of trading psychology is that it emphasizes the process of trading and not the process of generating fresh ideas worth trading. Creativity and innovation begin by looking at new information, questioning old assumptions, and using the new information to explore alternate assumptions. Here's an example from my recent trading: What if backtesting a historical set of data is *not* the best way of determining the odds of a market moving from point A to point B? What if a better predictor is the recent behavior of market participants at points A and B? The new data consists of very short-term readings of the upticks and downticks occurring among all exchange-listed stocks throughout the day. (Available via e-Signal). Instead of arraying the uptick/downtick data by time, we array it by price level: we look at each price and how much net upticking/downticking has occurred at that price. (Note that this is similar to arraying volume by price in a Market Profile). What we find is that there are certain price levels and ranges at which buying (upticking) and selling (downticking) has been dominant. Perhaps these price levels/ranges represent where the inventory lies in markets. Perhaps the odds of moving through a given price/range is a function of that inventory. Maybe yes, maybe no; I have an open mind. What I do know is that this is a different way of looking at markets and modeling forward returns. I don't know if any given innovation will yield an edge, but I am convinced that the failure to innovate will allow any possible pre-existing edge to erode. Looking at new information. Questioning old assumptions. Asking new questions. Viewing markets from different angles. These lie at the heart of what I call Trading Psychology 2.0. The challenge isn't simply to succeed, but to sustain success. The recent Brexit trade and its volatility has given us an opportunity to explore an important and neglected topic in trading psychology: time. Here's a useful distinction between novice and expert performers: Under pressure, the novice feels threat and speeds up. Heart rate, galvanic skin response, muscle tension--all increase under pressure for the novice. The expert performer has trained under pressure. Under pressure, the expert slows down and focuses. Put novices behind a rifle and the odds are good that when the target appears, they will speed their breathing, start to shake, and miss the shot. Put an expert sniper behind the rifle and breathing slows, all movement stops, and the aim is true. As a psychologist, I've experienced the same thing. During my beginning years, I felt panic if a client I worked with reported thoughts and feelings of suicide. Later, crisis talk made me hyperfocused. I hung on every word. I became more deliberate in my responses, more attuned to the person I was speaking with. 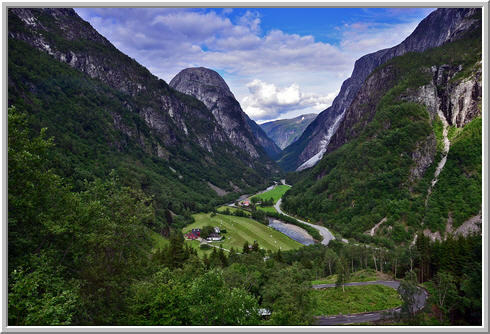 So it is with mountain climbers, professional athletes, and elite military units. They replace fight or flight with focus and freedom--the freedom to stay in control over a situation and not allow it to control them. OK, so what does all this have to do with the Brexit trade? As part of my trading, I have a short-term system that provides entry and exit execution guidance. The system adjusts entry and exit points for the market's volatility. During Friday's trade, the volatility unit risked by the system was about three times the size of the volatility unit from the first week of June. The same exact setup now could make or lose three times as much as recently. It was no different from tripling trading size all at once. But it wasn't just volatility that changed. 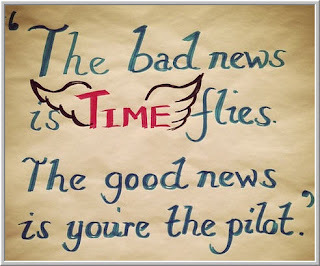 Time itself changed! The system works from event bars, not chronological bars. Each bar represents a number of ticks in the market, not a number of minutes or hours. For all of Friday, we printed almost 200 bars. For the first Friday in June, we printed nearly 60 bars. The novice is calibrated to the chronological clock and thinks in terms of standard trade sizing. As a result, each trade is far more risky. Under those conditions, market volatility begets emotional volatility and either the fight of reactive trading or the flight of the deer in headlights. Calibrated to the market clock and adjusting trade sizing for volatility, the trade opportunities are the same--there are only more of them in a given trading session. A crisis session for a psychologist is an entire therapy compressed into one meeting; it is what you do all along, only compressed. That compression is a catalyst for focus, because each time unit carries greater meaning and significance. The novice trader cannot adapt to changes in the market's clock. Movement slows, the VIX falls to 12, and boredom sets in--the need to trade. Movement picks up, the VIX nears 30, and excitement sets in--the fight and flight. Once you define time in terms of market movement, the switch from slow markets to fast ones is like the change on a dance floor from a slow tune to a fast one. There are times for slower and faster dancing...our job is to adapt to the market's music--not dance a given way regardless of the music that's playing. What Makes You Unique As A Trader? 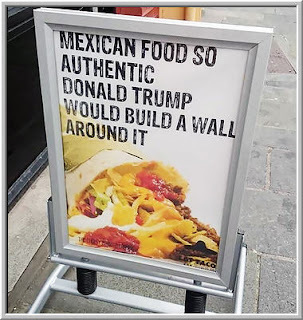 So we're walking in the old section of Bergen, Norway (Bryggen) and come across a Mexican restaurant advertising its food in a unique manner. From the looks of it, the sign was bringing people in. Whether it's in marketing or in trading markets, uniqueness counts for a lot. It's not always easy to predict who will make money as a trader, but it's not hard to predict who won't. The ones who won't succeed are the ones who are like all the others. They look at the same things and trade the same ideas. I've worked in many trading firms, from prop shops to hedge funds. Across settings, the correlation of returns among traders is disconcertingly high. When given the freedom to make their own decisions, many traders decide to abdicate critical thought and follow others. In general, uniqueness is expressed in two ways: by looking at new and different information and by assembling information in new and different ways. When I replaced time on the X-axis of my charts with event time, I redefined market data and could then view the data in a fresh manner. For example, the volatility of volume-based bars is quite different from the realized and implied volatilities that we normally track; the cycles that appear in event time are wholly different from what we can see in chronological time. Of course, being unique does not guarantee being successful; it's simply a way of generating more and different hypotheses. Some of these will fall flat; others will bear fruit. Being a trader is not so different from being an inventor. The great find often follows scores of disappointments. If you can't look at new possibilities and keep innovating, however, the successful invention will never follow. I recently wrote about strategies for constructively dealing with difficult markets. Our natural tendencies lead us to shut down when the world becomes less certain and when drawdowns extend. That, however, is when we most need to be open minded and expand our horizons. 1) What information are you looking at that others are not considering? 2) What ways of assembling information are you employing that are different from what others are doing? If I were a rational, prospective investor looking to back emerging talent, what could you show me that would convince me that you're truly doing something that is different and promising? If you can't sell a prospective investor on what you're doing, perhaps you shouldn't be buying into it yourself. Our time and capital are too precious to be wasted on "me-too". I'd like to advance a principle: The values and emotional/behavioral patterns that we enact in our trading inevitably reflect those we live outside of our trading. Who we are as a trader never strays too far from who we are as people. In that sense, there is no such thing as trading psychology. There is only psychology; we cannot sustain patterns in our trading if we do not live and reinforce them in our daily lives. We recently returned from a trip to Norway, trekking mountains and fjords. Every year we take at least one vacation that places us outside our daily routines and expands our cultural and environmental horizons. That's also time that we spend together apart from the routines of daily life. On a smaller scale, we use weekends to find new things to do and places to go. Sharing new experiences keeps a relationship new; it also keeps one from becoming too wrapped up in day to day work and markets. This emphasis on life perspective has been key to keeping a level head in trading. It is difficult to overtrade when you're seeing the larger picture of your personal and trading development. Similarly, adopting four rescue cats and being involved in the lives of our five children keeps us in a mode of servant leadership. It's tough to get overconfident in markets and trade with your ego when you spend a good portion of the day helping others. I was recently driving on a highway and the road split into two sections, each going the same way. The left fork was a single lane labeled express; the right fork was a double lane labeled local. My trip was several hours in duration but I immediately took the local option. My instantaneous reasoning was that if the single lane became blocked by an accident or car breakdown, traffic would be trapped--potentially for hours. If the double lane saw an accident or breakdown, there was a fighting chance of getting by in one of the other lanes. In short, I quickly made my decision based upon the management of downside (tail) risk. What this tells us is that, not only does our daily psychology become our trading psychology, but our trading psychology has a way of filtering into our daily lives. Trading teaches us lessons about risk, reward, discipline, and flexibility and those become life lessons. We trade with the psychology that we cultivate outside of market hours. Who we are as traders helps shape who we are as people. There is no trading psychology, only psychology. If there's a pattern you'd like to change in your trading, figure out how that pattern is playing out in your personal life and make that the focus of your change efforts. In other words, your goal should be to be the person outside of trading hours that you'd like to be in your trading. Life thus becomes a practice ground for trading, just as the reverse is the case. Becoming a better trader is no different from becoming a better person. Trading is a performance field, no less than athletics or the performing arts. What you see in any performance field is a dedication to practice among successful professionals. Indeed, from chess to Olympic wrestling to Broadway acting, there is no performance field I'm aware of where there is not a high ratio of time spent practicing to time spent performing among elite performers. So the relevant questions become: How much time do you spend practicing, and how do you structure your practice? The time you spend trading is NOT time spent practicing unless you have structured processes for reviewing your trading, systematically identifying what you've done right and wrong, and making efforts at improvement. As Bob Knight has observed, most of us have the will to win. What succeeds is the will to prepare to win. 3) Self management - How you maximize your state of mind and body for optimal decision-making. Each of these areas can themselves be broken down into subcomponents, so that you're drilling down to the level of best practices: what you do in each area that is most responsible for your success. Such a list can anchor daily/weekly score cards that allow you to evaluate yourself in real time, identify areas for improvement, set goals, and make corrective actions. If you are not continuously keeping score and taking concrete action on the scores you receive, you can't be continuously learning and improving. Writing in a journal is a great first step, but ultimately matters little if the journal entries don't guide concrete goal setting and efforts at improvement. 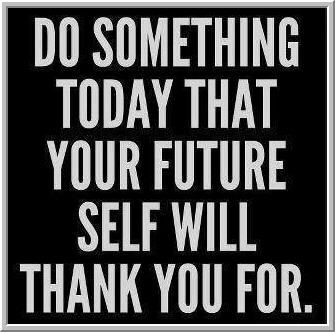 It boils down to this: Are you doing things today that you will thank yourself for later? Successful traders don't have a passion for trading--that just leads to overtrading. Successful traders have a passion for self-improvement. They are motivated to be more tomorrow than they are today. Landry's quote is a great one. What it really says is that reaching our potential means that we have to face uncomfortable truths. If what made us comfortable was what made us great, everyone would be a super achiever. Sadly, that's not the case. I recently gave a talk to a group of traders and interrupted the presentation to ask each person to tell the group the most exciting idea they had come across recently and how they were incorporating that idea into their trading. The silence was deafening. When a few ideas did come out, they were very general ideas about performance--nothing specific to markets. That told me everything I needed to know. These were market participants who were not hearing what they didn't want to hear and seeing what they didn't want to see. They were in their comfort zones. They were static. They were in the process of being left behind by evolving markets. I'm writing from Oslo, Norway. I woke up last night with an unsettling thought. What if the entire narrative approach to markets--turning data (fundamental, geopolitical, technical) into a directional, narrative thesis for trading--no longer works? It's not just that markets respond to different narratives. It's that markets have become sufficiently complex that simple narratives cannot capture the significant patterns that are present. For example, we can predict the likelihood that a fuzzy camera image of a person actually *is* that person, but narratives have nothing to do with the predictive process. This kind of thing happens whenever we travel to remote locations. Getting away from routine helps stimulate new thoughts, often uncomfortable ones. I have no f***ing clue as to whether the death-of-narrative idea holds water, but I'm quite sure I'll dig up a platform for investigating complexity in market behavior and see if there are patterns outside of simple interactions of variables amenable to storytelling. I've described the coaching process as comforting the afflicted and afflicting the comfortable. Both push us outside the states we're in to see different realities. 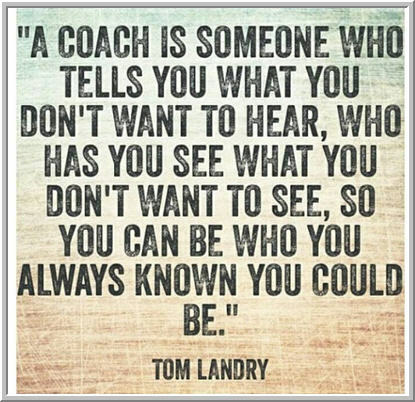 The most successful traders have internalized that coaching that process. 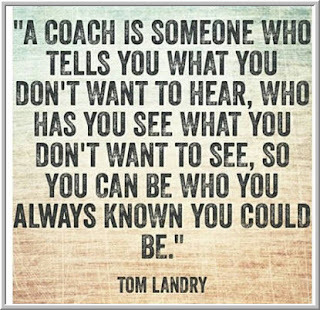 Coaching is not merely something they hire; it's something they actively do. Seeing new things, asking new questions, learning new skills--pushing, pushing to be more than you are at present. That's the essence of a true competitor. Mia Bella is the gray cat we rescued from a high kill shelter in Kentucky in 2014. She has become a very special part of our home. Unfortunately, a week or so ago, I began to notice changes in her behavior. Her energy level decreased; her eating declined. We brought her to the vet and it turned out that she was running a persistent low-grade fever, most likely the result of an infection. As of this writing, her condition is improving. What was striking in Mia's situation was that, as her fever set in and her energy level decreased, the most distinctive aspects of her personality began to drop away. 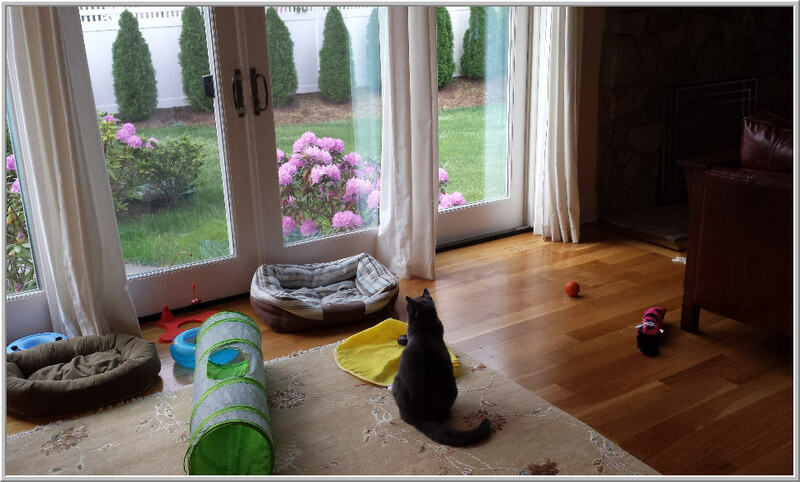 A very social cat who loves to play with the other cats in the home, Mia increasingly chose to isolate herself. Her affectionate attachment to us, most observable when she would follow me to the basement in the morning and share in my early routine, similarly waned. She stopped going into the basement. More subtly, she stopped behaving in the little ways we had come to love, from telling us that she wanted food to looking out the sliding glass door to watch the animals in our yard. In a sense, Mia had stopped being Mia. That's what alerted us to need to seek a vet. But there's an important principle here: Our greatest strengths--what make us distinctive as people, as spouses, as traders--are dependent upon our energy level. When we lose energy, it is as if we descend that hierarchy of needs described by Maslow and hoard our remaining energy for basic activities such as sleeping, eating, and staying alert. Mia no longer had energy for her curiosity--her looking out the window, her seeking out the other cats. Even going up and down stairs was a chore. The Mia Principle--the expression of our strengths is a function of our energy level--is vitally important to anyone operating in a performance field such as trading. Our cognitive strengths, our ability to detect patterns in real time, our ability to dig beneath the surface of information to generate ideas, require a high degree of clarity and alertness. Our personality strengths, from our ability to engage meaningfully in relationships to our ability to rebound from setbacks, require sufficient energy to sustain constructive efforts. The Mia Principle helps explain many performance slumps. We fall short of our goals and become discouraged. We work harder to succeed, only to become increasingly overloaded and overworked. Each new effort drains us of further energy, ensuring that successive attempts at success become increasingly inefficient. When we are in performance drawdowns, we're typically in energy drawdowns. What we need is inspiration, not further drains on our energy level no matter how well intentioned. Ironically it is the most achievement-oriented of us, the most persistent and driven, that are most likely to fall into the energy trap. If Mia's experience holds true for us, our greatest performance hurdle is that we spend far too little time in states of inspiration. When we have fewer activities that give us energy than require energy, we gradually power down. At such times, the lower power drains our strengths. Like Mia, we continue to sleep, eat, and take care of life's basics, but what suffers is what most makes us who we are. We lose our strengths, our greatest competencies and life visions, when we lose our energy. What if our trading performance doesn't require umpteen efforts at discipline, but rather a consistent connection to our greatest energy sources? We struggle to adapt to markets, but we're never likely to succeed if our struggles drain us of the vital resources that make us who we are. Many trading challenges are embedded in the language we use to describe markets. Among the most common things I hear from traders is that markets are difficult to trade because they are "choppy" and "noisy". What, precisely, does this mean? A clue to the meaning is that we never hear the opposite. When was the last time you ever observed a trader high-fiving because markets were "smooth" and "predictable"? When have you heard someone making money attribute profits to market "noise"? Yet another clue to the meaning is that very few traders actually measure market choppiness/noise. It's not that noise and signal are part of an explicit trading framework; rather choppiness is used as a reason to either explain losses or to not trade at all. From that perspective, a choppy market is one that cannot be successfully traded. It's the market equivalent of playing in a casino where the game is severely rigged against the gambler. Perhaps that is why so many conversations that start on the topic of market chop veer onto the topic of "algos" and their "manipulation" of markets. As Wittgenstein observes, language captures our limits and our possibilities. If our language describes people of a certain race or ethnicity as inferior people, we will sustain all sorts of behavioral biases against those people. If we feel a need to trade to make a living and our language construes markets as impossibly noisy, frustration is the inevitable result. The trader who bemoans choppy markets is really conveying the meaning, "I find this market untradable and frustrating". The problem with such language is that it leads to no possible solution. If I regard a class of people as worthless, I have basically blocked any potential positive interactions. If I view markets as filled with noise, I block any efforts to identify signal. The traders I see making money are employing language differently to make sense of frequently-changing markets. For example, several traders I know are trading shorter-term strategies and longer-term strategies and adjusting the weighting of those based upon how markets are moving. A good example was yesterday's trade in the ES futures. We had early selling off the weak jobs number, but many sectors of the market displayed buying interest. The advance-decline line was unusually strong, given the decline in the average, and we never hit a selling extreme of -800 or less in the NYSE TICK measure. This was a useful tell that the selling was part of sector rotation, not part of a general bear/risk-off move. Recognizing this made it much easier to take profits on short positions early in the day and not get whipsawed by the afternoon strength. A more radical language shift is to break markets down into cycles and trends and identify when each mode is dominant. This leads to mean reverting trades in cyclical regimes and momentum trades in trending ones. Note here the conceptual shift: noisy markets are defined as cyclical ones. That leads to a potentially constructive direction: identifying whether there is a dominant cycle that can be expected to continue into the immediate future. An adaptive trader trades the market conditions that exist, not any preferred regime across the board. My own trading has proceeded with a yet more radical shift. I start with the idea that *only* cycles exist in financial markets. What appear as momentum/trend and value/mean reverting periods are simply different phases of cycles that exist at varying frequencies. It is the interplay of these longer and shorter duration cycles that creates the complexity of movement within markets. When cycles at shorter and longer frequencies are in mean reverting mode concurrently, markets will look choppy. When multiple cycles are aligned in up or down phases, markets will look trending. It's all one elephant and we're the blind men feeling various parts of the animal and trying to figure out what it looks like. A natural consequence of adopting the language of cycles is that it naturally leads to an attitude of "this too shall pass." Indeed, if we think of multiple cycles aligning in a mean-reverting mode, that suggests that multiple cycles may be peaking or cresting. 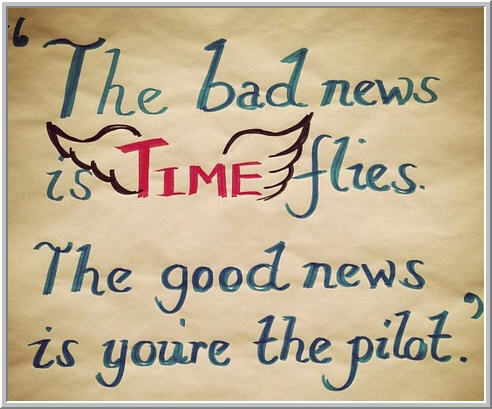 In such a case, the periods of greatest choppiness would tend to precede the periods of greatest opportunity. 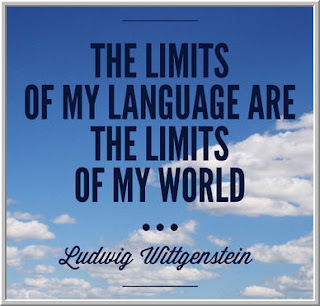 Language frames our problems and language frames our opportunity set. I strongly suspect there are no markets devoid of opportunity; only impoverished mindsets.